The Enclave, one of the Fallout franchise’s oldest factions, is set to reappear in West Virginia when Fallout 76 launches next month, Bethesda confirmed today. The Enclave is a group of descendants of high-ranking U.S. government officials, and they’ve played an important role in Fallout games in the past. The official Fallout Twitter account tweeted an image of an Enclave character this morning, along with the organization’s logo. The inclusion of the Enclave is interesting for a couple of reasons. First, the group was the ‘Big Bad’ in Fallout 2 – they kidnapped the population of the town of Arroyo, as well as all the inhabitants of Vault 13, to use them as test subjects for a Forced Evolutionary Virus serum its scientists were developing, eventually with the goal of spreading the serum worldwide. The Enclave has access to highly-advanced technology and weapons, and they’re not a nice group of folks – they believe they have a constitutional right to reform the American government, and they’re willing to do whatever is necessary to make that happen – non-members are considered expendable at best. 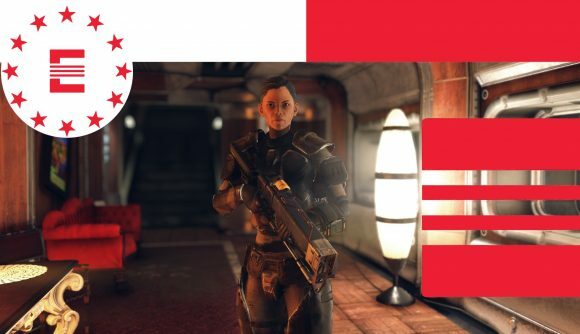 Since Fallout 76 doesn’t feature non-player characters, it seems that the Enclave (and the recently-announced new faction, the Responders) will be groups that players themselves can join, potentially following different questlines for each group. We’ll find out when Fallout 76 launches November 14.